A few things have occurred over the past few days and I wanted to just say my thoughts on them. This story broke my heart and it just brought up memories of Junior Seau’s death. We don’t know what caused it and if it had anything to do with brain damage. But it reminded me a lot of Kenny McKinley and how he was suffering through a hopeless feeling and killed himself after trying to rehab back onto the Broncos. I want to put this out there that people who have never been on the verge of suicide should never judge people who do commit suicide. You’ll never understand what it takes to push someone over the ledge. And I don’t want to judge Murdock for his actions. There could have been a lot of factors to it. But this death adds more to the black cloud over the NFL and its current state of players killing themselves. I hope this isn’t part of the concussion issue that’s going on. But at the same time, something wrong is happening and we need to stop it. @SamuelYLam Five years ago today, HOF #49ers HC Bill Walsh passed away. One of followers tweeted me a reminder that today is the 5-year anniversary of the legend Bill Walsh’s death. I remember where I was when I found out the news. I was in New York coming off another long day of work from my internship. Back then, I didn’t have a smart phone so I didn’t know what was happening around the world until I got home to my computer. Back then in 2007, I had just started my coverage of the 49ers for MVN.com (which has now turned into this very poorly run site). It was a sports blog and I was using that platform to hopefully one day launch me to bigger and better things. With training camp underway, let’s take a look at where the 49ers were and what they’re trying to get done this season. Pretty neat recap from NFL Network’s own Ian Rapoport on his trip to 49ers HQ. And as for his question about West Coast tape delays, yes, I avoid Twitter and Facebook all together. As the Saints practice at their training camp facility in Metairie, Louisiana, the figure of Sean Payton still lurks in the distance with the head coach serving a year-long suspension. 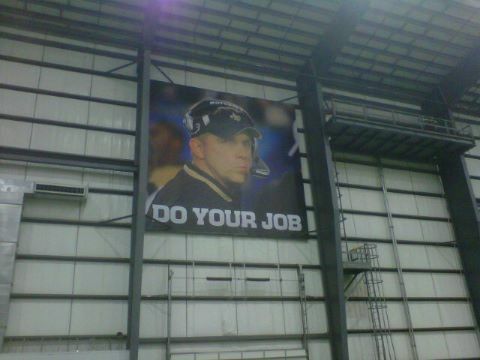 A large sign of Payton hangs in the building with the Belichickian phrase “Do Your Job” in large letters below his picture. Mr. Bean stole the show. I liked last night’s Opening Ceremony. I had my fix of classic British rock, including Paul McCartney and lots of fairytale folklore. But the only thing that really caught my attention was that of Mr. Bean. 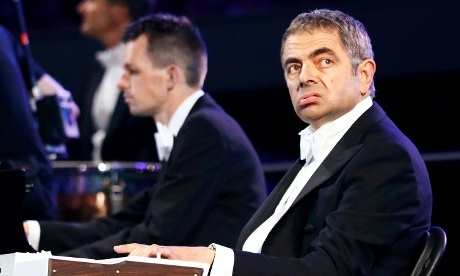 I am a huge Mr. Bean fan and seeing him there was all I needed to see. I wouldn’t be surprised if Davis hangs out with the president on a few more occasions later in life. 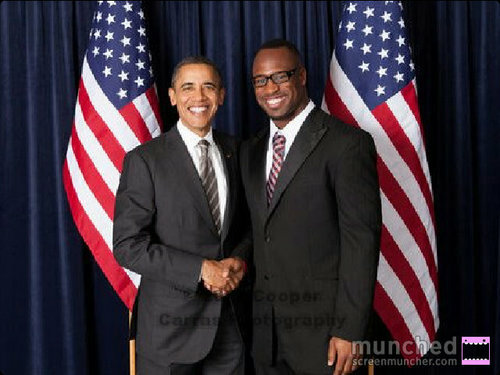 I covered San Francisco 49ers tight end Vernon Davis for the past three seasons with my work with Examiner.com and every time I think about those years, I always enjoyed every opportunity I had to interview him and see him grow. I’ve become a fan. On the football field, he has established himself as one of the best tight ends in the game. His blocking ability and his route running continue to improve and his chemistry with quarterback Alex Smith is very special. As a football player, Davis has been a team leader for a few seasons and it’s very apparent a lot of younger players look up to him. I’m excited to see Davis continue this fantastic career he is putting together and lead the 49ers to a Super Bowl win. He has the tools and the right structure in place to make it happen. I truly believe that he can lead the 49ers to the promised land.